For years I was using a clumsy multi-part PA system; 2 speakers, power amp, mixer, and about 100 feet of cabling connecting everything. This was a pain to bring around to gigs, and even harder to set up when time was of the essence. This inspired me to research all-in-one PA systems; portable powered speakers that you could plug a mic into directly. It had to be loud enough to compete with a full-blown PA, yet also small and lightweight enough to easily bring on the road. I ended up choosing the Monoprice APS 15 since it had the most power for the price and a built-in 3-channel mixer. However, there were a few good options, depending on one's specific needs. I decided to compare single 15” speakers since this is typically loud enough for medium-sized venues. If you’re looking for a smaller PA, you can find equivalent models in 12” or 10” sizes at a lower price. Pros Best value, built-in 3-channel mixer. Highest power, lowest weight. Best for DJs, battery powered. Inputs (x2) Dual XLR & 1/4"
First: How Much Power Do I Need? You may notice some speakers are advertised at a higher power than in the table above. For example, the Mackie Thump and Pyle Bluetooth are both advertised at 1000w. This is because they are measuring peak watt power, which is a bit misleading. Peak wattage is the loudest an amp can output in short bursts. RMS wattage, on the other hand, is how much power a system can put out consistently. It’s a much better measurement of a speakers’ loudness and performance. In fact, you can pretty much disregard peak watts entirely. This was the portable PA speaker I wound up choosing. It’s powerful, compact, sturdy, and features a 3-channel mixer on the back. You can plug in up to 2 microphones at once, as well as an instrument or mp3 player. For bands with multiple vocalists or audio sources, the extra inputs are a deal-breaker. It saves you the effort of bringing a separate mixer + cables. Monoprice built-in mixer. Click to view full size. Overall, I was impressed by the quality of this speaker. The tone was very full, crisp and deep, and the build quality was strong. The APS 15 features a metal grate to protect the speakers, and hard plastic around the exterior. However, the plastic is a little thin compared to other models. If you need something to last for years on the road, I would opt for a sturdier model, like the Mackie Thump or the Behringer Eurolive. A reputable name in pro audio, Mackie makes a great portable PA that offers a few key advantages over the Monoprice APS. Mackie manages to cut the weight by over 10 lbs (33.2 lbs compared to 44.1 lbs for the APS), yet still deliver an extra 100w of power. This makes it great for those who require lightweight gear, and/or need a little extra power. On the flipside, the Mackie Thump15 only has 1 input. You can plug in a single microphone, but will otherwise need a mixer for multiple audio sources. Furthermore, the only input is an XLR, so you’ll need an adapter to plug in an instrument or iPhone/mp3 player (or otherwise set up a mixer). 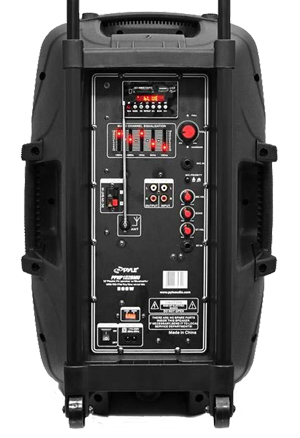 The Pyle Bluetooth PA was designed specifically for DJs, whether it’s a backyard wedding, basement party, or a small indoor club. For one, Pyle provides several easy ways to hook up a smartphone/laptop: RCA, USB, and bluetooth connectivity, as well as an SD Card port. Secondly, there’s a built-in rechargeable battery that provides up to 3 hours of playback, so you can provide tunes even on the beach, or other outdoor areas. Last but not least, there’s a ¼” mic input, and wired microphone included free, which you can use simultaneously with your tunes. So what’s the catch? Pyle is a budget audio brand, and with so many novel features packed into their Bluetooth PA, it’s unsurprising that roughly 1 in 5 reviewers reported issues. This ranges from smaller issues like charger cable failing, or the bluetooth connectivity problems, to more serious issues like broken parts. The Pyle Bluetooth PA is not the most reliable option for somebody who performs a lot on the road, but could be a good economical option if you’re willing to be extra careful. Since most people need a portable PA system that can travel with them to shows, they need something durable. Likewise, since many performances require multiple microphones or instruments going through the PA, it helps to have a model with a built-in mixer. This is why I ultimately choose the Monoprice APS 15. It's not quite as rugged as the Mackie Thump15, but it's powerful, well-built, and features a 3-channel mixer on the back.